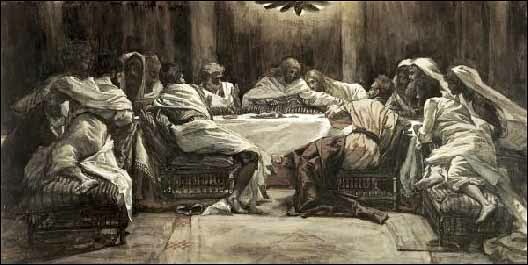 James J. Tissot, 'The Last Supper: Judas Dips Bread into the Bowl' (1896), Brooklyn Museum, watercolor. View each painting by clicking on the arrow to the right. The numbers of the pictures are from a catalog of an exposition of these paintings at the Art Institute of Chicago, January 26-February 23, 1899. Good images of most of Tissot's paintings of the Gospels are now available for viewing on the Brooklyn Museum website.